The Mille Miglia 2016 was held 19-22 May over 1,600 km (1,000 miles) of Italy’s most beautiful regions, starting and ending in Brescia. 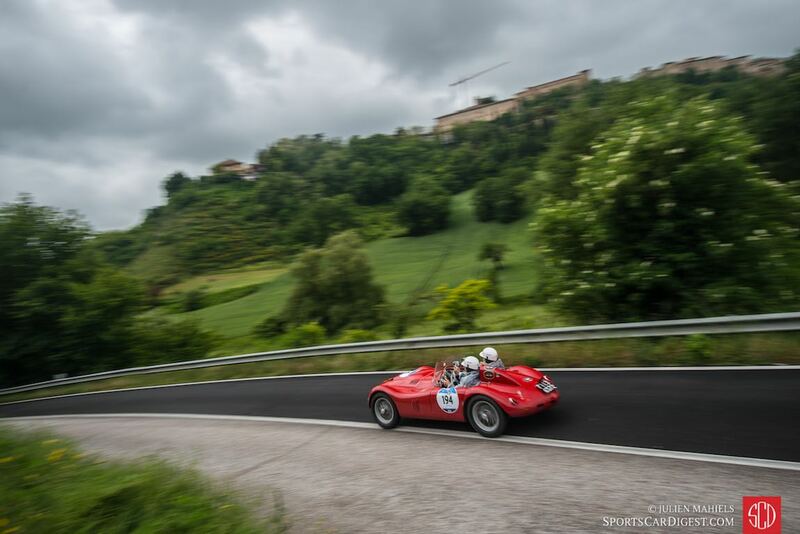 This year’s 1000 Miglia — the 61st edition to be held under this name since 1927 — took participants along a ride between historic villages, following an itinerary which although featuring some variations with respect to the previous editions, kept with the tracks of the twenty-four races held from 1927 to 1957. The 34th retrospective edition saw a great field of historical automobiles celebrate the legendary Mille Miglia endurance road race. 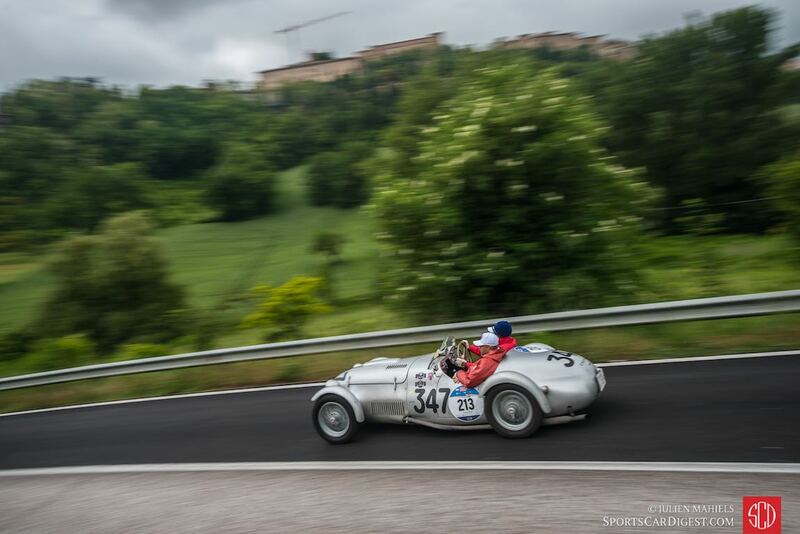 Of the 440 entrants at the Mille Miglia 2016, more than 70 took part in at least one original Mille Miglia racing edition. The cars at the Viale Venezia start included 71 marques, with the lion’s share going to Alfa Romeo with 46 cars, followed by Fiat with 39, Mercedes-Benz with 33, Lancia with 25, Ferrari with 22, Porsche with 21 and Jaguar with 20 entries. Notable was the Ferrari 340 with which Gigi Villoresi won the 1951 edition, as well as Benito Mussolini’s Alfa Romeo 6C 2300 Pescara, which ran the Mille Miglia in 1936 driven by Ercole Boratto. 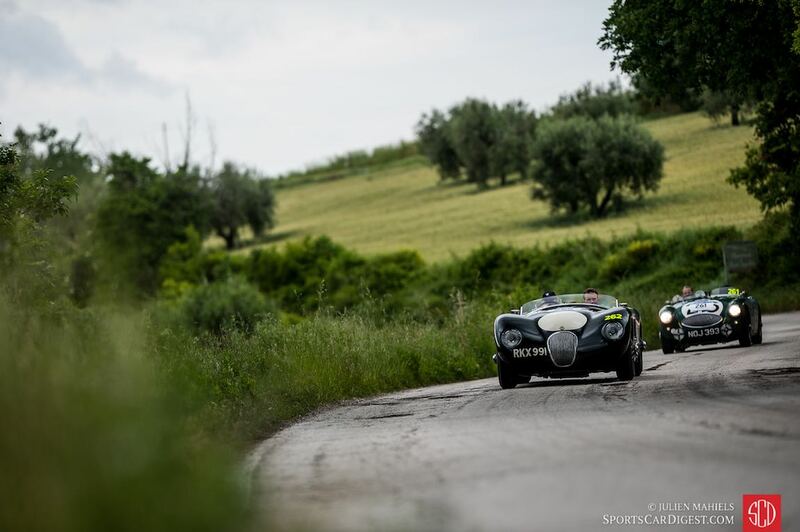 The Mille Miglia 2016 began in Brescia, Northern Italy, in keeping with tradition. The first of four stages went through Verona and Ravenna, to the Adriatic coast at Rimini. 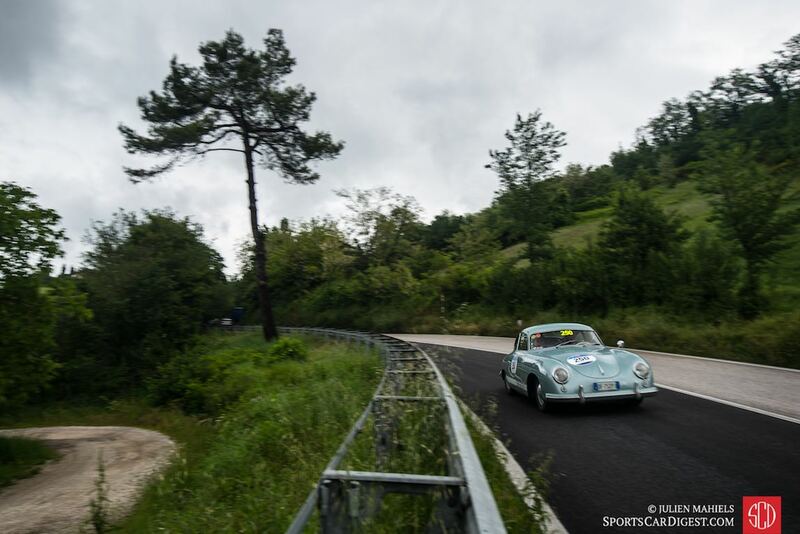 On the second day of the competition, the field of classic automobiles initially passed San Marino, before going on to Rome, taking in Macerata and Ascoli on the way. A reception awaited the cars and their drivers in Rome. A few days later, Poggibonsi in the heart of Tuscany was the destination for the midday stop. Before that, the convoy of classic cars winded its way through Siena, before powering along the roads of Pisa and Luca. The afternoon journey took them over the legendary Futa Pass and shortly afterwards over the Raticosa Pass, before reaching Parma in the evening. 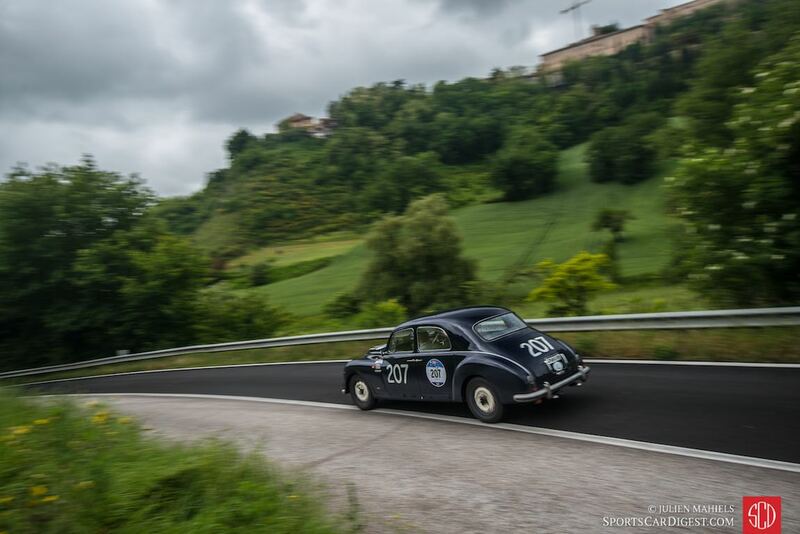 The final stage of the Mille Miglia was routed via Piacenza and, after timed trials at Monza Autodrome, back to the start of the 1000 mile drive in Brescia. The 1930 Alfa Romeo 6C 1750 Gran Sport Zagato of Andrea Vesco and Andrea Guerini won the 2016 running of the Mille Miglia. The well-known Brescia couple were followed on the podium by Luca Patron and Elena Scaramuzzi in a 1926 O.M. 665 Superba Sport 2000 CC and the 1933 Alfa Romeo 6C 1500 Gran Sport of Giordano Mozzi and Stefania Biacca. The winning Alfa Romeo 6C 1750 Gran Sport model also won the 1930 edition of the race with Tazio Nuvolari and Giovanni Battista Guidotti as crew. That edition was the race of the legendary “overtaking in the dark” episode when Nuvolari averaged 100 km/h over the entire course for one of Alfa Romeo’s record eleven wins in the original race years of 1927 to 1957. The special Women’s Cup, reserved for entirely female crews, was won by Silvia Marini and Saskia Stoeckkelmann in a Riley 12/4 Sprite from 1936. They were in advance of the female teams of Loes and Annemarie Van De Velve, in second place in the category, in a Lagonda M 45 Rapide and ahead of two professional German drivers, Susie Wolfe and Ellen Lohr, who placed third in a Mercedes-Benz 300 SL. 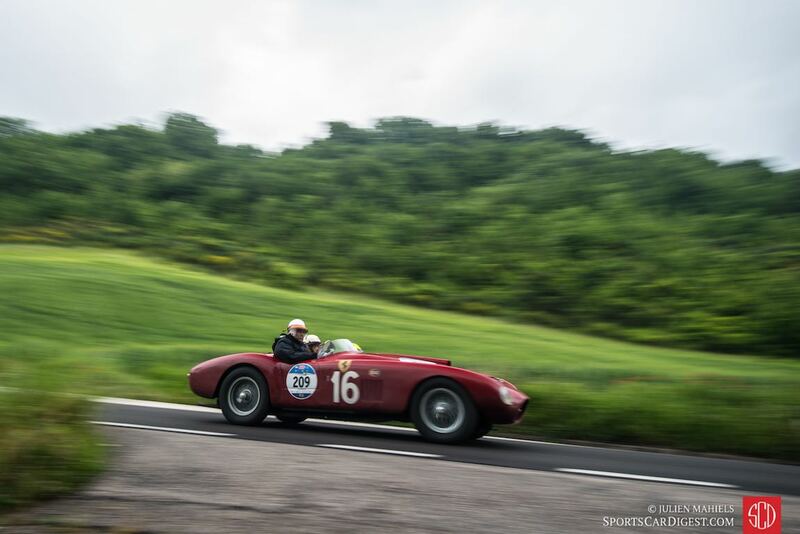 Similar to 2010, 2011, 2012, 2013, 2014 and 2015, Sports Car Digest also documented the 2016 Mille Miglia Rally, with Senior Photographer Julien Mahiels offering the following stunning picture gallery that highlights the interesting field of entrants and the charming Italian landscapes. We split up Julien’s pictures into two galleries. The first gallery starting below features our favorite images, while the second gallery and rally results can be found on the last page of the article and gives a comprehensive view of all the photographs. To see more from Julien, visit julienmahiels.net. Thanks for including some b&w shots – those are great!! Rare and beautiful cars in fantastic settings, and great captures – well done ! Thanks for bringing us these! Super Pictures It gave me great pleasure to look at them. – You made an “old man” very happy!! Beautiful shots – put MM firmly on my bucket list! Julien Mahiels is a freelance sport photographer living in Brussels. Inheriting the photo virus from his mother and the motorsport one from his father, he has spent the past seven years combining these passions by capturing the essence of speed and motion. Julien has worked for many automotive firms and publications. Besides photography, he is a freelance graphic designer working in event management and brand activation. To see more, visit julienmahiels.net. To purchase any prints or digital files, contact Julien at julien.mahiels@gmail.com or via his website.